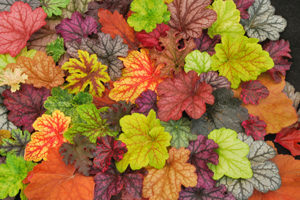 Plethora of Heuchera leaf color and variegation. 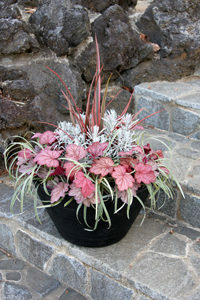 Dan Himes, Portland’s own plant designer, of Terra Nova Nurseries took the old fashioned Coral Bell, a simple cottage garden plant that was beloved for pale spring flowers and created the dramatic colorful leaves of the modern coral bell (Heuchera). He didn’t stop there. Over the past 30 years he has given designers a whole new color palette to create with: leaves of peach, orange, russet, burgundy, amethyst, chartreuse and near black. Many of the leaves are variegated and create the most amazing patterns. He has also created many different sizes of plants. 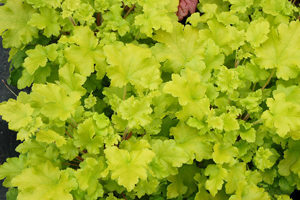 I can use a Heuchera in the mid border with the top of the leaves at 10 inches tall and 24 inch flowers like ‘Lime Marmalade’ or plants a mere 5 inches tall with 10 inch flowers like ‘Cherry Cola’. In recent years he has also created a diverse selection of flower colors. 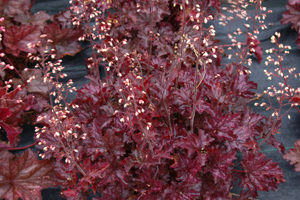 ‘Cherry Cola’ Heuchera is great at the edge of a pot. The original garden coral bell bloomed in pale pink, today I can have flowers in hot brick red, coral, hot pink, near orange (no true orange yet) varying shades of yellow and even shocking chartreuse. Some varieties are really all about the leaves and the flowers are a very quiet white or cream with stunning dramatic leaf color and variegation, but the newer varieties can have it all, bold dramatic leaves with the perfect hot flower color to accompany them. So many choices are exciting to me but can be daunting to a typical home owner. Twenty different varieties can stop a person in their tracks. I’m not trying to pick a pretty plant, it would be hard to do as they are all attractive. 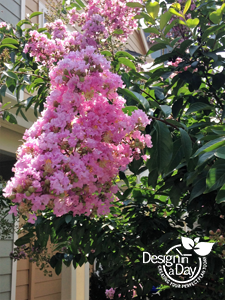 I always design for function and select a plant for what I want it to do. I use ‘Blackberry Crisp’ because the leaves look good even in the winter. They are perfect for entry pizzazz. Some Heuchera flower for a long time in summer but have no winter interest so I use those near the patio. There are many varieties I use for shade and some for near full sun. I love to use the new 5 to 6 inch tall plants at the edge of containers. These little guys look great with Spring Heather and Hens & Chicks. Coral Bell can pull a garden together visually by repeating it along a pathway. Their shape softens the potentially harsh lines of a modern minimalist garden plan. 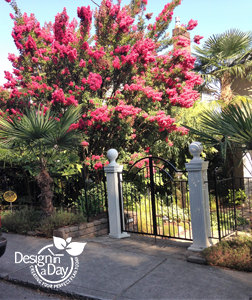 No matter what your style, old fashioned, naturalistic or modern they add the dramatic color that every client wants in their landscape. Dan’s contribution is significant. There are many plant designers in the world and many of them worship at Dan’s feet. I was in the Netherlands visiting a famous garden designer and plant designer named Piet O’Doff who designed the 9/11 memorial garden. After he learned I came from Portland, Oregon he said to me, “why did you come all this way to see me when you live 15 minutes from Dan Himes”? 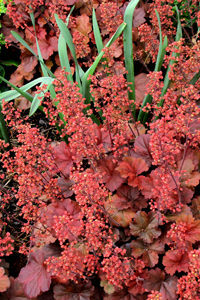 Heuchera softens the edges of pots beautifully. From a designers point of view Dan’s work is very exciting. His plants give me so many choices to create the perfect planting plan for my clients. True confession: to keep up with Dan Himes, I created a spreadsheet on my favorite coral bells so I can select them for size, foliage color, flower color, foliage height, sun exposure and more. It’s not that easy for me either. The new plantings complement and enhance the house colors, which fulfilled my clients top request. Before: Classic NE Portland bungalow needs thoughtful no lawn landscape plan. Garden designers love to be asked for our cards, especially under these happy circumstances. I had created a design for the back yard a few years prior. Cathy was so pleased with the results she called me back to design the front. She had a list of priorities for me and at the top was her concern about selecting plant colors to work with the dark plum brown foundation. Cathy had put a lot of effort into paint color selection for her bungalow including historic research. The plum brown was a very powerful color and I was excited to work with it. Friends and family and the postal carrier love using the new path to the side door. Another unusual feature of the house is that it has two front doors. The family tended to use the side front door and so did the friendly neighborhood mail carrier. When we made a beautiful stone path to the side front door there was a lot of joking about how much the mail carrier would like his new path. With me it’s always a collaborative process. I wanted to add drama to the front walk so when I suggested we offset the front steps Cathy thought about it and vetoed that idea. So to add interest I brought in boulders, set them back from the walk so there would be room to place interesting plants as companions to the boulders. This made the design even better. I loved Cathy’s existing rock garden and selected a similar style of plantings around the public sidewalk. So this helped integrate what was left of the old garden into the new design. The best thing about the design is how beautiful it makes the house look. White Coneflower (Echinacea purpurea), Blue Oat Grass (Helictotrichon sempervirens), some sedums and creeping thyme are holding there own in this NE Portland parking strip. 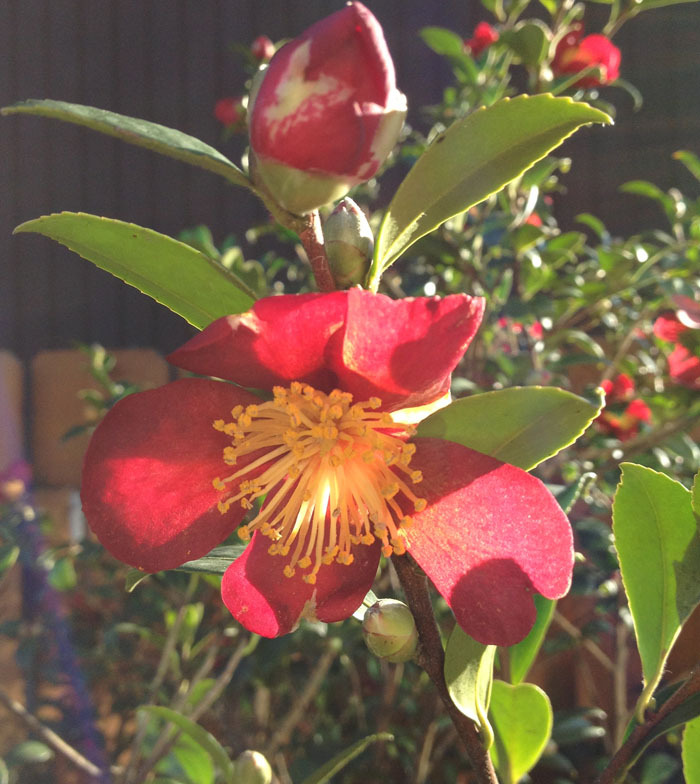 Cathy used my plant broker, Homescaper, to purchase her plants. He worked closely with Cathy’s contractor, Tellurian Gardens who installed the landscape. Now my only job is to drive by and deliver a nice stack of business cards and ooh and aah.